American reporter, columnist and activist James Kirchick was kicked off the air of a network funded by Russia's government Wednesday after criticizing the station's coverage of anti-gay laws in Russia. Kirchick was brought on to Russia Today from Sweden to discuss Bradley Manning, as the network awaited the sentence of the army private accused of leaking classified information. Strapping on rainbow suspenders he instead took aim at Russia's recent anti-gay law banning "propaganda of nontraditional sexual relations." "Being here on a Kremlin-funded propaganda network, I'm going to wear my gay pride suspenders and I'm going to speak out against the horrific anti-gay legislation that Vladimir Putin has signed into law," he said on air, adding that the law "effectively makes it illegal to talk about homosexuality in public." RT anchor Yulia Shapovalova cut in: "Yes, James, of course we'll discuss it later, but what about Bradley Manning?" 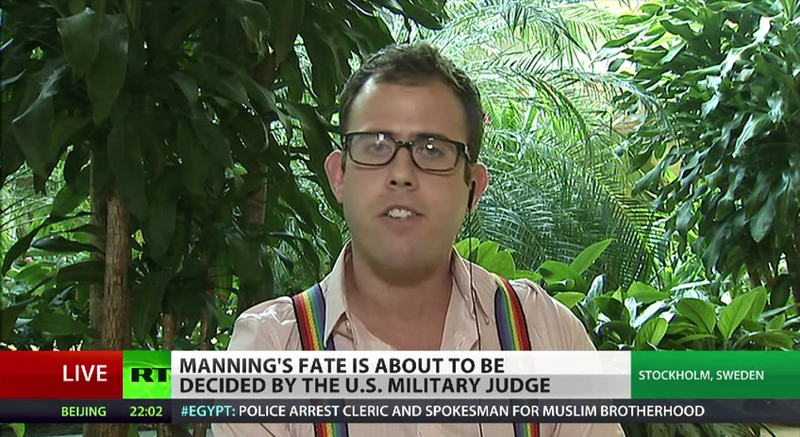 "I'm not really interested in talking about Bradley Manning." Kirchick shot back. "I'm interested in talking about the horrific environment of homophobia in Russia right now." Kirchick is also a fellow at the Foreign Policy Initiative, an American conservative-leaning nonprofit which warns in its mission statement of "rising and resurgent powers, including China and Russia." He has taken shots at Russia in the past in written pieces for various news outlets, including a recent column for New York Daily News titled "Romney was right about Russian foe," criticizing the country's harboring of NSA-leaker Edward Snowden. On Wednesday, he extended that criticism to Russia's treatment of gays, and the limited coverage of the network it funds. "I don't know how as a journalist you can go to sleep at night, seeing what happens to journalists in Russia, who are routinely harassed, tortured and sometimes killed by the Russian government," he told Shapovalova and her on-air co-workers. "RT has been Bradley Manning and Edward Snowden twenty-four-seven. I haven't seen anything on your network about the anti-gay laws that have been passed in Russia and the increasing climate of violence and hostility towards gay people. Where is the coverage of that?" RT's news editor Ivor Crotty defended the station's coverage, noting that earlier in August they hosted a panel on the issue. "I think you'll find it very informative," Crotty told Kirchick. "It's an issue we take very seriously on the channel." A search of RT's Youtube station does reveal stories about the anti-gay laws, but with a discernible lean. One segment uploaded August 5 was titled: "West's warped vision of Russian gay life leads to 'crackdown' cries & vodka waste," a reference to protests in the United States which featured the dumping of Russian vodkas. RT moved on to another reporter discussing Manning, and Kirchick's microphone was cut. He later told Politico that he usually avoids appearing on RT, but felt the need to draw attention to the issue and "shame" the network. He was surprised at how long they gave him to do that. "I thought they would cut me off much sooner. They actually sort of engaged me in the topic which I'm shocked by," he told the site. He tweeted later on Wednesday, that the network had called the taxi company they paid to bring him to and from the shoot, and instructed them to stop and leave him "on the side of the highway on way to Stockholm airport." Soon after, he assured his followers that the taxi company delivered him to the airport safely. Russia's anti-gay laws have sparked protests across the globe, and concerns about the country's hosting of next year's Winter Olympics in Sochi. Kirchick's appearance won him widespread coverage and many laudatory tweets from fellow journalists and activists. "Thank you everyone, but there's nothing 'brave' about what I did today," he responded on Twitter. "The real 'bravery' is shown every day by Russia's #LGBT activists." Mr. Kirchick was invited to appear on RT's panel as author of article 'Bradley Manning gets off easy,' in order to contribute to RT's discussion of the Bradley Manning verdict - obviously the major international news event. Mr. Kirchick decided to instead use this time to express his opinion on LGBT rights, a matter which, while important, was entirely unrelated to the subject of the panel. Regretfully, RT had no other recourse but to continue the discussion without him. Regarding Mr. Kirchick's transportation: Per Mr. Kirchick's own subsequent statements, apparently nobody actually tried to drop [him] off on the side of the road" and in fact he enjoyed a free and pleasant ride to his destination. But it's rather surprising that he expected us to pay for his taxi ride in the first place, after attempting to sabotage RT's broadcast.